EHO ep. 13 Papa Johns, Crazy NFL Trades, Whats up with the Cavs??? 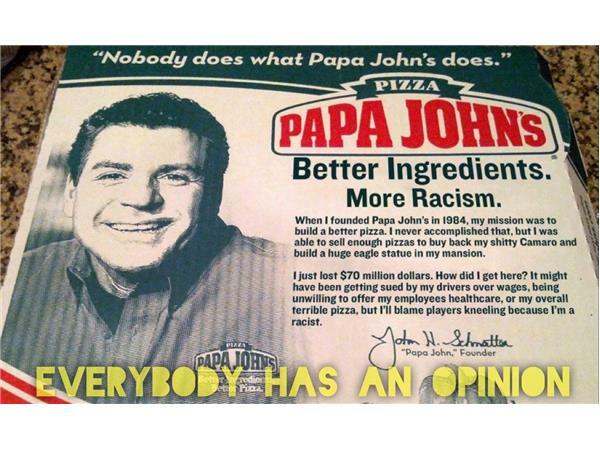 Let me start off by stating that I (Chris) believe that Papa Johns pizza has been trash for quite some time. They never leveled up like their competitors which is why we found their CEO blaming the protests as the pivotal force behind their declining sales nothing but laughable. Philly now has a Jay and a Blount. And The Cavs are just playing so weirdly we have to express some concern, I mean they are awesome in 2k. Join the discussion, @EHOPodcast on twitter, @everybodyhasanopinion on IG, everybody has an opinion on FB.